I read books regularly, but I don’t consider myself a voracious reader. This year (2018), I have read two books so far. That means reading one book in two months. That’s not a lot. However, when I teach a class or facilitate a workshop, it creates an impression that I read a lot. Sometimes after my session, some participants ask me for book suggestions. Occasionally, I get a question, “Can you give some tips on how to increase the speed of reading?” This has triggered following question: Is it really important to read fast? This is what we explore here. I first realized the difference in reading speeds when I started using in-class reading material. Most of my workshop participants are working professionals with 10+ years of experience. They find it difficult to read a 20-page case study as a pre-reading. Moreover, my teaching style does not require recreating the market context so I create two-three page caselets which participants read in the class. When some participants finish reading the case, a few others would not have finished even half. There could easily be a difference of 2 to 3x in fastest and slowest reader in every class. So, in some sense, reading speed matters. But how much? 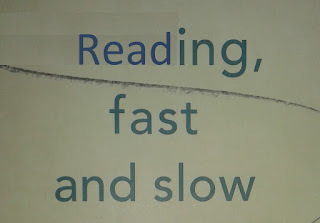 When I look at my reading style, I see two modes of reading, fast and slow. When I read Easterine Kire’s “When the river sleeps” last month, it was read in the fast mode. However, when I read Isaac Newton’s biography last year, it was read in the slow mode. What exactly is the difference between these two modes? Actually, the difference isn’t much while reading. Since I read both these books on Kindle, the slow mode involves highlighting and adding notes, a feature kindle provides. But what happens after I finish reading makes a bigger difference. For some books, I re-read part of the book; I write notes in a notebook and sometimes create mind maps. I check out the interviews of the author especially in the context of the book. I read what other reviewers are saying especially to see which part of the book appealed to them. I typically try to pen down anything that surprised me. In the past few years, the two books which resulted in “slowest reads” are Daniel Kahneman’s “Thinking, fast and slow” and David Bohm’s “Thought as a system”. I read Bohm’s book four times in a span of one year. For both these books, I created detailed mind maps. Bohm’s book is a transcript of a weekend seminar and the audio recording of most of the seminar is available on the Internet. I listened to the 4 or more hours of audio 3-4 times. I have been listening to Kahneman’s talks / interviews since 2008 i.e. three years before “Thinking, fast and slow” was published. I have listened to Kahneman’s talk at UC Berkeley “Explorations of the mind” published on YouTube 10 years ago at least a dozen times in the past ten years. In short, the slow reading involves a fairly deep reflection on what the author is trying to say. It usually means creating a few hypotheses that are contrary to the beliefs I have held so far. It further involves creating experiments to test and re-test these hypotheses. Slowly some of this gets added as teaching material in the workshop. I also end up writing multiple blogs when I am reading slow. 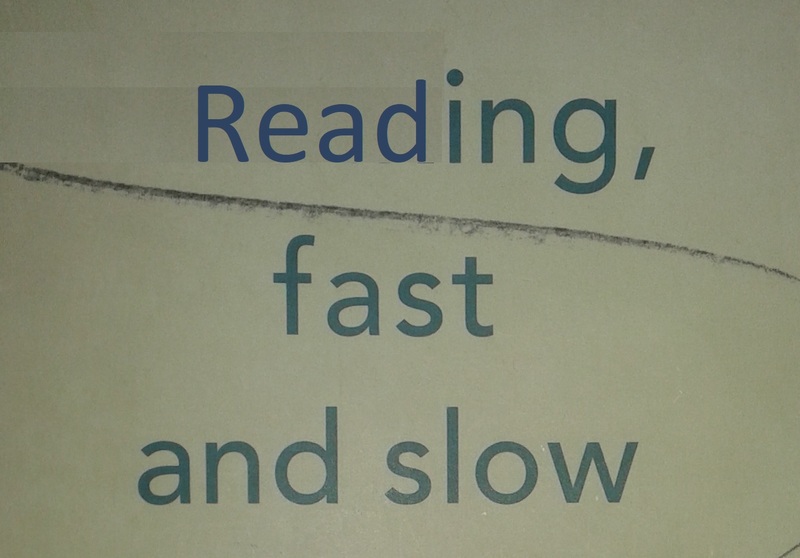 The boundary between fast and slow reading is not always that stark. The novel that I read sometimes puts me in a reflective mode without being aware of it. When the story doesn’t go out of my mind, I usually end up writing something about it. Have you read any book in the slow mode lately? 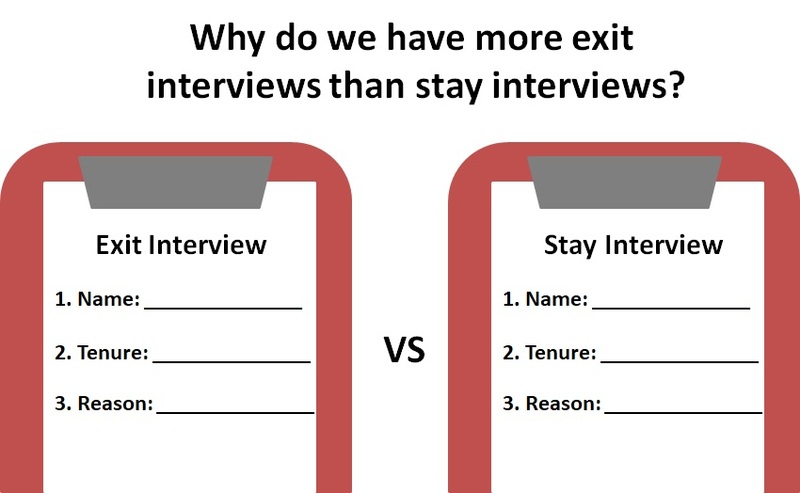 Why do we have more exit interviews than stay interviews? Most of us are familiar with exit interviews. But how many of us recall a stay interview? It is an interview in which someone is curious about why you have been staying with the company for so long. 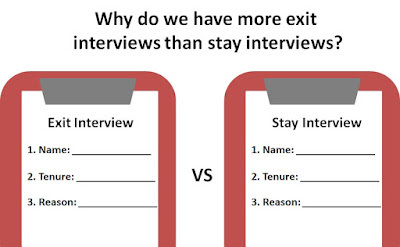 Why do we have more exit interviews than stay interviews? Could it because we have an inherent bias for dark spots (areas where things are not working) as compared to the bright spots (areas where things are working)? If so, are we losing out on a valuable source of ideas? That is what we will explore in this article. I have owned a data card ever since I started my independent consulting practice more than a decade ago. Initially, it came in the form of a flat card that I used to insert in the PCMCI slot on my laptop. After a few years, it changed its form and became a dongle to be inserted into the USB port. I stayed with the same telecom operator for over a decade and the only time I got a call from someone was when I switched my operator a few months back. The person on the other end was curious why I was leaving. I had already bought a wifi hotspot from their competitor and had no interest spending time in explaining things. All I was looking for was a hassle-free exit. What use was the exit interview? If customer attrition is a problem, then paying attention to staying customers may give a clue. If lack of individual student attention is a problem, then there are some classes or some teachers who are within the same environment and paying more individual attention. How? That may give a clue. If you don’t like your job (a problem) then those moments in your office which give you a joy (bright spots) may give you a clue where you may want to focus. 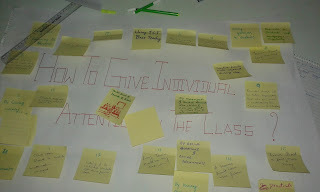 Here is an exercise with science degree college teachers where they explored solutions to the problem “How to give individual attention in the class?” The class size was large – 70 to 100 students. Some teachers felt strongly that in a class of such size it is not possible to give individual attention. However, when they were asked to list bright spot – things they are already doing at least in some classes, at least on a few occasions, a number of ideas came up. One can see the ideas in the picture below. Teachers realized that there is so much to learn from each other. To summarize, following a bright spot is a powerful principle which nudges us to pay attention to what is working already. It brings attention to what is possible and moves attention away from a feeling that it is not possible. Who knows? Perhaps all that matters in moving from inaction to action is this “possibility”. 2. 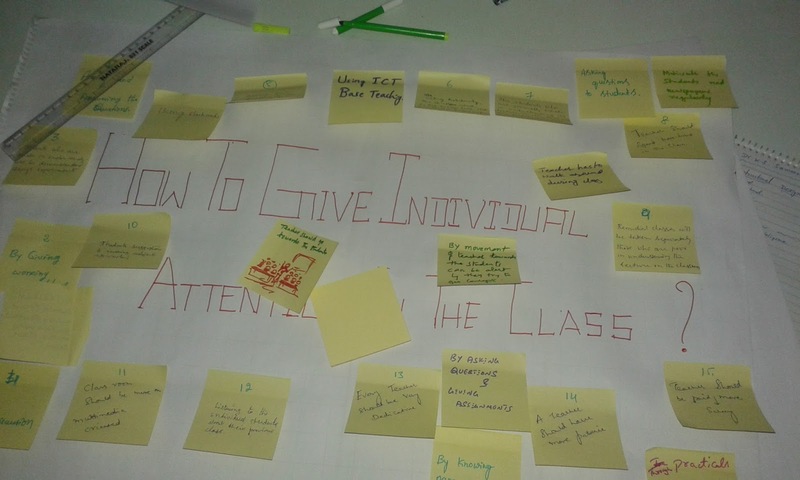 “How to get individual attention in class?” problem was one of the challenges identified by science degree teachers of Government colleges at a design thinking workshop I facilitated in Agastya International Foundation’s Kuppam campus earlier this year.